Clay tile roof installation hasn’t changed much over the years. This beautiful and old form of roof covering can last many decades when properly installed. Clay tile roofing has been around for centuries, in many parts of the world. In America, clay roofing was introduced by European settlers, and took hold after stronger fire regulations were introduced in the 1660’s. 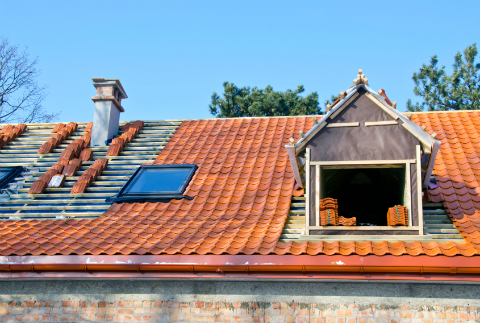 Clay roofing remains an architectural staple in many parts of the United States, particularly Florida and California. By and large, clay roofing is secured with nails. Usually copper nails or another non-corrosive nail is used. The second most common method is with the use of lugs or nibs which project out from the roof. The clay tiles are hung from these lugs. Today, these styles are often also secured with nails for additional assurance. Other less common forms include hanging clay roofing with wires, clips or laying them in adhesive foam. These methods are usually done in areas with special weather concerns. Assess your roof decking before attempting to walk on it. Fix any areas that show signs of rot or wear. Install your underlayment. This is important with clay tile roofing, as it substantially increases your roofs’ water-tightness. Use chalk to draw horizontal and vertical lines on your roof to serve as a guide, ensuring your clay roofing pattern stays consistent. Install drip-edge flashing, and gutters. Given the substantial life expectancy of a properly installed clay roof, use only the best quality metal for your flashing and gutters. Begin to lay the first course of your tiles. Follow manufacturer’s instructions, as every type and style of clay roofing may require a slightly different method. As with the flashing, use only the best quality metal nails that are corrosion resistant, lest you want your clay tile roofing to start falling off. Once your first course is attached, observe it from below to ensure it is straight. Clay roofing, as a natural material, can vary slightly in color, so rearrange the tiles now if you are unhappy with the color scheme. If you are happy with the result, continue laying successive courses until your roof is finished. Properly installed clay tile roofing has been known to last for over 100 years. The main problem with clay roofing is poor fastening, whereby clay tiles start slipping and falling off the roof. This is a direct result of poor materials and a poor clay tile roof installation. Clay roofing is not the cheapest form of roof covering available, so if you intend on investing in it, it is highly advisable to contract a qualified clay tile roofing contractor.